Sierra Newt in Hetch Hetchy. 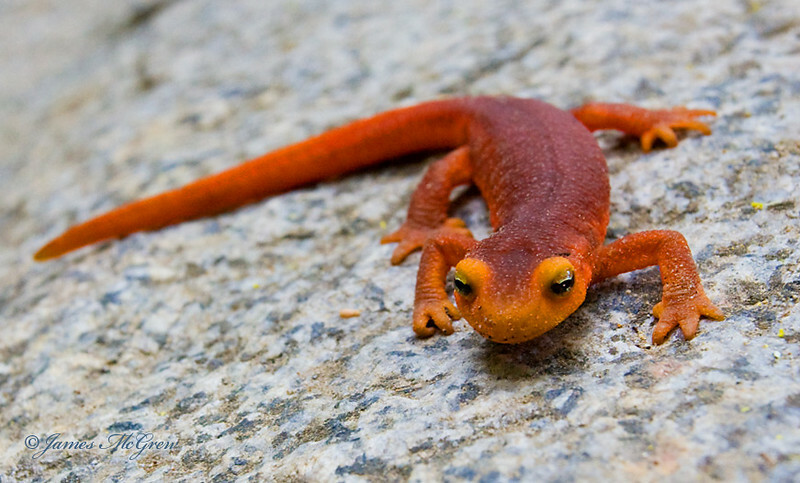 Adorable and beautiful, the newts appear in profusion after a rain and early in the morning. They can migrate for miles and return to their breeding grounds (apparently using the earth's magnetic field). Their bright orange colors serve as a warning signal to predators. In fact, the newt's skin secrets a deadly neurotoxin similar to that found in pufferfish. The only animal known to eat these amphibians are certain types of garter snakes which are fairly immune to the toxins. However, like most amphibians around the world, Sierra Newts appear to be declining in numbers. While the causes of decline of many species of frog and toad are well documented, the newts remain poorly studied by comparison. Copyright © 2008 James McGrew.